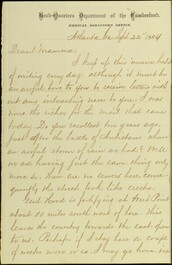 The Digital Library has digitized Robert M. O’Reilly’s collection which includes letters written home to his mother, Ellen Maitland O’Reilly, in Philadelphia, during his career in the U. S. Army which lasted over 40 years, from 1867-1909. It is interesting to note that O’Reilly wrote his mother on printed letterhead from the Head-Quarters Department of the Cumberland, Medical Director’s Office. There is a total of 3 letters O’Reilly sent from the Headquarters. Check out an earlier blog post on the Robert M. O’Reilly collection. Want to download the transcription? Go to this page and click on the “Download” button found at the bottom left of the screen. Select the format desired: word document or pdf format.